Well today I was kept very busy but not so much with Addi. He was totally zonked, sleeping for most of the day. Which fortunately gave me plenty of time to do the first of five paintings I’m doing for our church parents room. After moving into their new building Southport Church of Christ’s walls in their parents room are totally bare. So I decided that I would have to do something about it! 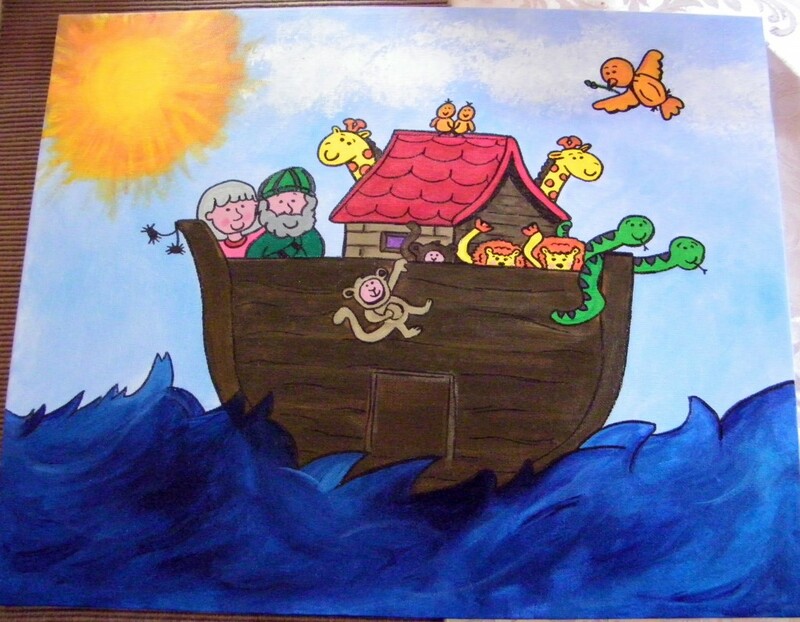 I picked the theme of Noah’s Ark as kids just love animals and it gives plenty of opportunity to use lots of bright colours. Here is the first and largest of the five paintings I will try to get done over the next couple of weeks to donate to the church. Thanks Ashleigh! I just finished the next one: Adam and Eve. I’ll have to post a photo soon. Next is the birth of Jesus! I love your paintings! They are sooo cute! i have been using your craft idea’s for my daughter, Trinity. You’re quite tallented! If you are on facebook, check out my page… bunkie buddies and hats… God Bless! Thanks Johanna!! They were a lot of fun to do, but a bit ticky when Addi demanded attention So glad that you have been able to make some things for Trinity!! I would love to see pics if you would like to email melissa@lissylane.com – I’d even like to feature them on the blog. Thanks for all the great feedback! !